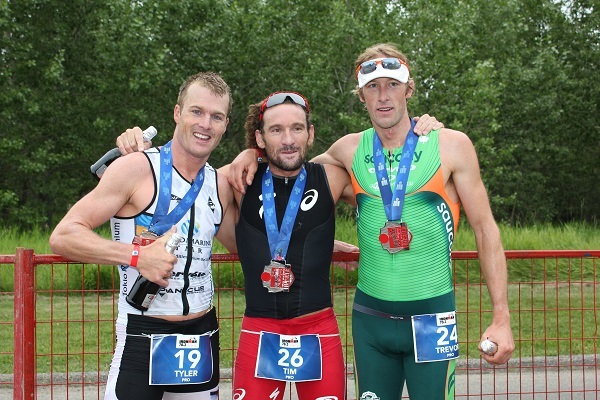 [Updated] Bermuda’s Tyler Butterfield has finished 3rd in the Ironman 70.3 Calgary AB challenge. The Calgary AB course has been voted one of the top ten most scenic triathlons in the world by Triathlete Magazine. Butterfield clocked a time of 3:43.38, he finished one minute and seventeen seconds behind Tim Don from Great Britain who crossed the line in a time of 3:42.21. Trevor Wurtele from Canada finished second with a time of 3:42.57. Butterfield covered the 1.9km Swim Course in a time of 24:12, coming out of the water in 5th place, Butterfield next covered the 94km Bike Course in a time of 1:39.08, Butterfield then concluded the 21.1km Run Course clocking 1:40.18. Update 4.37pm: Tyler Butterfield has confirmed that he has now earned entry in October’s Ironman World Championship in Kailua-Kona, Hawaii. Butterfield’s Calgary performance, along with points accumulated at prior races this season, moved him into 30th place in the Kona Points Ranking, wherein the top 40 men as of the July 28th early round cut off qualified for the Kona race. Speaking after he received his Kona qualification, Butterfield said: “With so many races on Sunday that could potentially affect the rankings, it was a nice surprise to know for sure so quickly that I made it. With less than 11 weeks remaining until the world championship in Kona, Butterfield will prepare from his home base in Boulder Colorado. He’ll head to Hawaii a few days before the race, with his wife Nikki, daughter Savana, mother, father, brother, sister-in-law, niece and nephew all joining him in time for the competition. How many points does he get toward toward the Ironman World Championship from this result and where does he stand now?